The California Baptist University Events Center hosted the inaugural Tip-Off Dinner for CBU’s men’s and women’s basketball teams Oct. 20. Fans of the basketball teams at CBU had the opportunity to buy tickets for $50 to get into the dinner while getting to know the men’s and women’s teams and the cheer team’s game-day squad, Golden Girls. 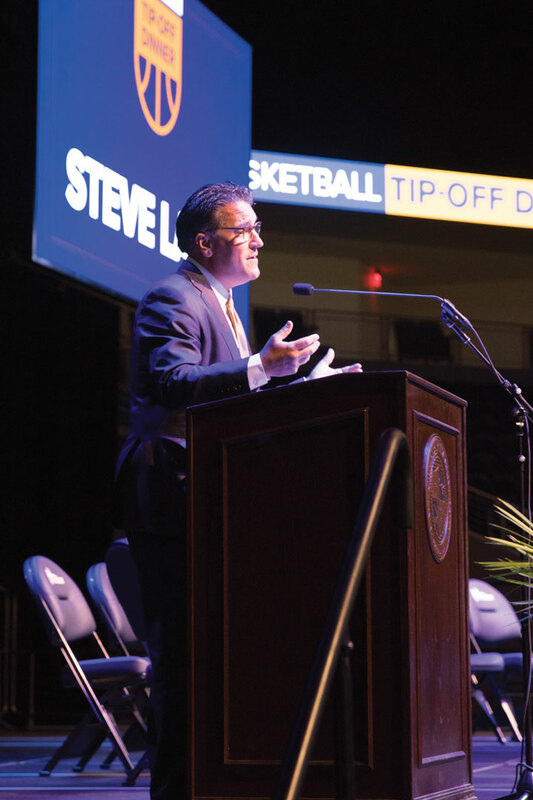 Steve Lavin, former college basketball coach for Purdue University, the University of California, Los Angeles, and St. John’s University and former television analyst for ABC and ESPN, spoke and hosted a question-and-answer session. Rick Croy, head coach of men’s basketball, and Jarrod Olson, head coach of women’s basketball, spoke about the season and posed questions about this season to athletes from both the men’s and women’s teams. Lavin said the main purpose of the dinner was to celebrate the start of another college basketball season. Lavin also said this is his 30th year associated with NCAA Division I college basketball, both coaching and doing analytical work for TV. After coaching for many years, he is currently working with Fox Sports and the Pac-12 Network. Lavin said CBU has all of the necessary elements to succeed in Division I.
Olson said the point of the Tip-Off Dinner is to connect with the CBU community. “Men’s and women’s basketball has a lot of great people on their teams and it’s great to be able to interact with people in our area,” Olson said. With this season being the last in Division II, Olson said the season should be interesting to see what it has in store. Croy said the Lancers have great depth going into the season and said he felt good about going into next season. “We have great senior leadership that is really excited to get going into the season,” Croy said. Men’s and women’s basketball will begin their season in the CBU Events Center Nov. 10. The men’s basketball team will play against California State University, Dominguez Hills, at 7 p.m. The women’s basketball team will play against California State University, San Marcos, at 11:30 a.m.